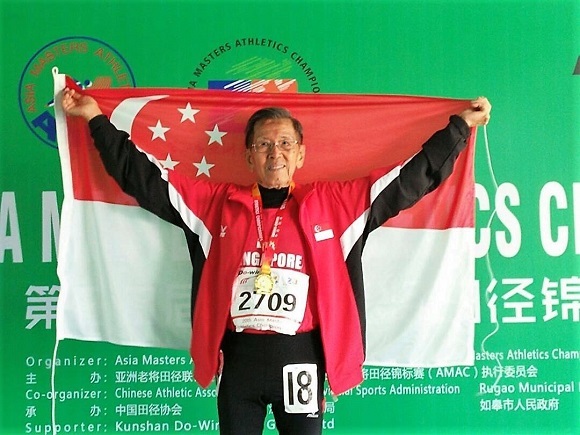 Congratulations to Mr Kor Hong Fatt, 85, for winning gold in the 10,000m (Men's 85 age group) at the just concluded 20th Asia Masters Athletics Championship (24-28 Sept 2017) in Rugao, China. He is an inspiring role model for the rest of us. My son-in-law, Dr Ansgar Cheng, 51, was also in the same Masters Championship. 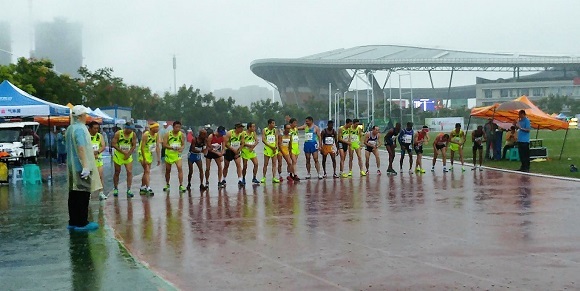 He ran in heavy rain to bag a silver in the 5000m in the 50-54 category for men with a time of 17:52. 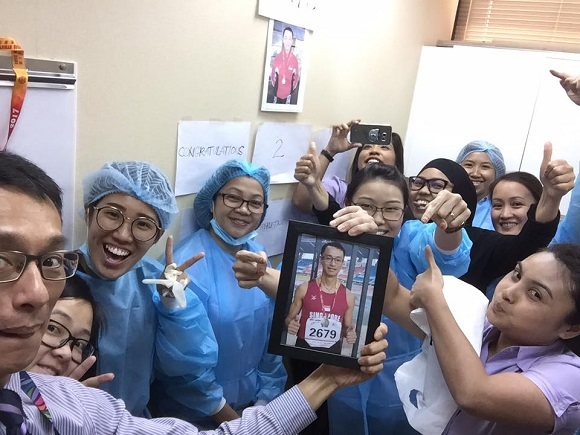 On his first day back at work after returning from Rugao, his clinic staff welcomed him back with a framed photo of him wearing his silver medal. It must have been a lovely surprise for him. 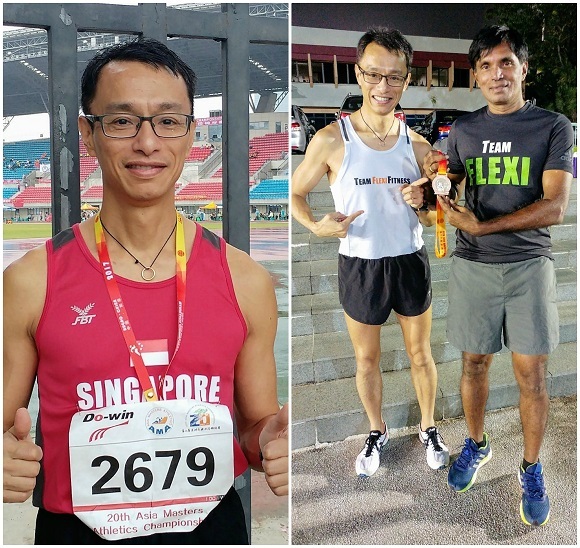 He received another round of congratulations later at the CCAB track from his coach Rameshon (below right) and fellow FlexiFitness running mates. My elder daughter, Moon, 48, took up running initially to join husband Ansgar and their two daughters, Allie and Hana. But she soon developed her own passion for the sport as well. Now she trains three times a week with the family at the CCAB track. She recently ran her personal best (PB) of sub-1hr in the 10km in the POSB Run 2017. Moon was recently interviewed about her interest in running. 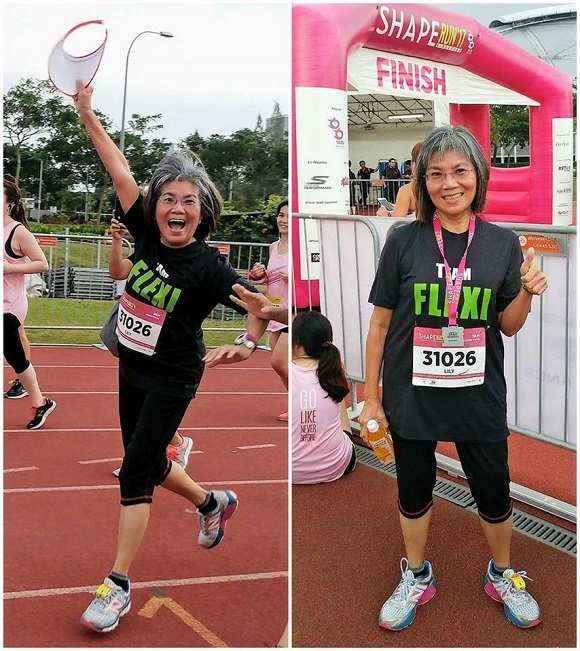 Click here to read about how she went from couch potato to running mom. Her next run is the Great Eastern Run where she hopes to up her PB. 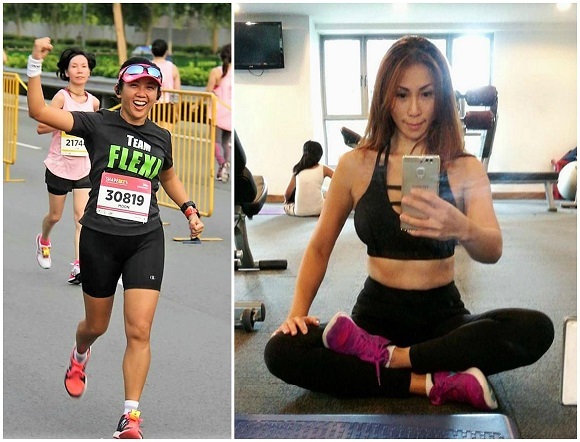 My younger daughter, Belle, 46, hates running, but is passionate about yoga, kick-boxing and zumba classes, preferring to sweat it out in air-conditioned comfort on a carpeted floor, rather than pounding the tracks (or road) under the hot sun. If results are measured by weight loss and muscle gain, both have certainly achieved their goal and more. All my four older grandchildren had an early start in sports, especially in running. At the age of five, they had already entered competitions, starting with school sports, then graduating to bigger races and competitions. 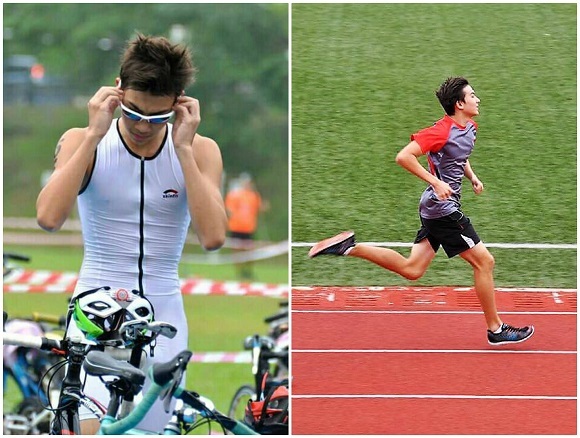 Max, 17, was a regional triathlete until recently when he decided to cut back on competitions. He has been interviewed on Nickelodeon. 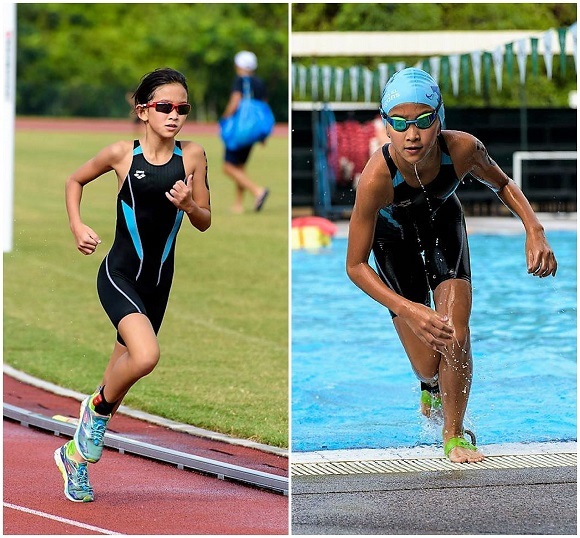 His sister, Reiya, 12, is following in his footsteps, and has turned out to be a budding triathlete with medals to show for it. Allie, 14, and Hana, 13, have been improving steadily in their PB. They enjoy their training 3-4 times a week, and occasionally enter competitive races. 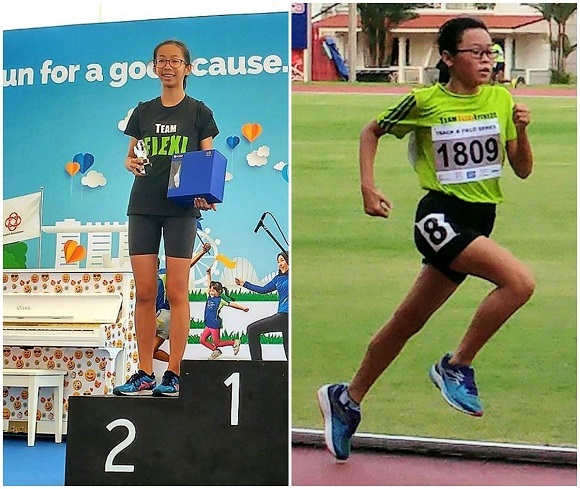 Allie emerged second in the POSB Run 5km Open (for women), and Hana was fifth in the inter-school cross-country earlier this year. 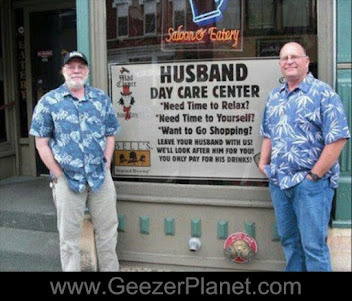 I have no doubt they will be adding to their haul of medals and trophies in races to come. That leaves two more in the family to mention - the oldest (that's me) and the youngest (that's Ryder). I hung up my running shoes a long long time ago, preferring to do brisk walking and line dancing for fitness. I used to spend hours at the gym five times a week in the 1980s. I was a fitness fanatic then. I remember sometimes doing three hours on the treadmill on top of strength training and aerobics. 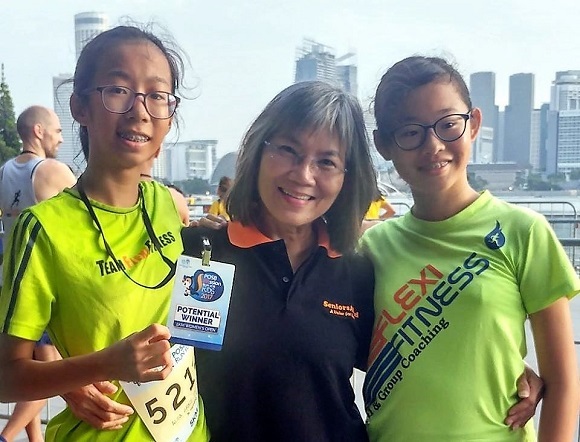 Now that I am staying with the Chengs while studying for a one-year full time course at NTU, who knows I may just get back into running, or at least slow jogging. Moon registered me for the Shape Run last month, and also for the upcoming Great Eastern Run next month. I am more likely to walk than run, as I have not been training at all. 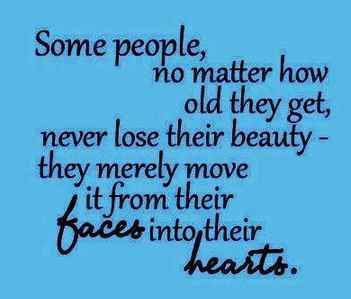 But it's a start at age 69. Just after the Shape Run - my first road event in almost 30 years! I survived it. Finally, there's my grandson, Ryder, 3+. This little superboy became a small YouTube sensation when his dad posted a video of him dribbling a football at 13 months. Watch how he fell, picked himself up, and continued. I am glad he still has this trait of trying and trying till he succeeds. 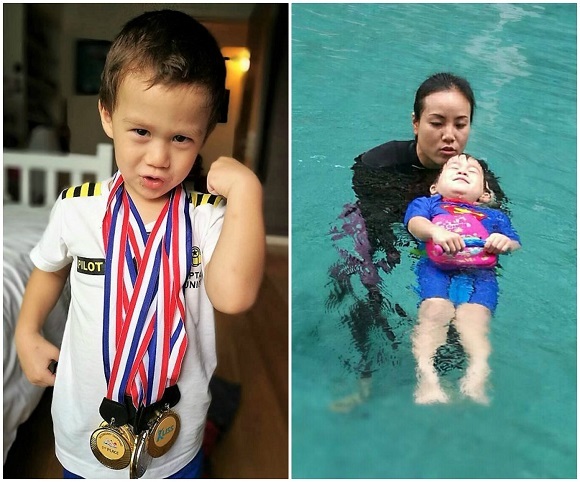 He loves to show off his physical abilities, from planking to cycling, and now swimming. He has just started taking jiu jitsu classes. Ryder wants to emulate big bro Max and be a champ and a finisher in all he does. The sports world is his oyster. As the saying goes, the family that runs together, stays together. 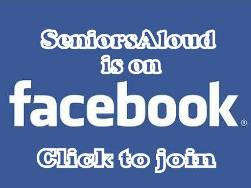 It's great for intergenerational bonding, not just within your own family, but also with other families that run. An excellent example is the team from FlexiFitness. The group has grown, and resembles an extended family where the parents train together with their children, and everyone is so supportive of one another. If you are in KL/PJ, and would like to pick up running, or join a runners group, check out KLCC Runners Group. 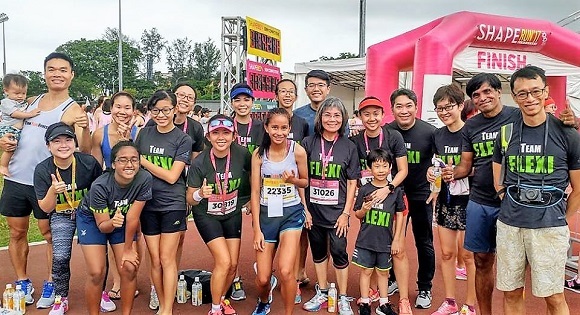 If you live in Singapore, I recommend FlexiFitness. You won't find a better coach than Coach Rameshon. He holds the national record of 2hr 24min 22sec for the men's marathon - unbroken since 1995. As more older adults take up running and other sports, the Masters Athletics Championship will likely get more competitive. I am sure Ansgar is keen to represent Singapore again in the Masters next year, and the next. 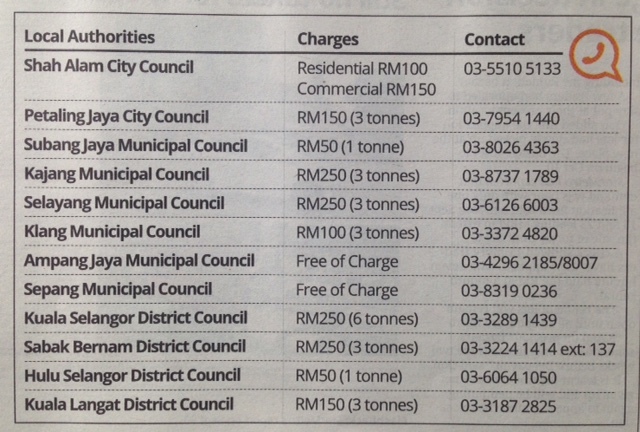 After all, Mr Kor started running at 75. Now at 85, he is still running and winning. Salute!